Activity Toys & Dolls Prams. 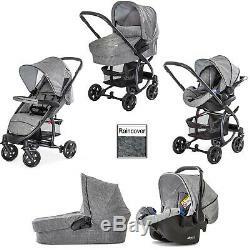 Hauck Malibu 4 Trio Set Travel System - Melange / Grey. Suitable From Birth Newborn Carrycot Pushchair 0+ Car Seat Compact Fold. Accommodating you child from birth and with a maximum weight capacity of 25kg (well over and above legal standards), the Malibu 4 Trio Set is a fantastic travel system that comes with pushchair, carrycot and 0+ car seat. Surprisingly light in weight, the Malibu is agile, nimble and a pleasure to push. With the cosy carrycot attached, the pram offers your little one a secure environment where they are sure to feel safe and relaxed. If preferred, the 0+ car seat can be fixed to the chassis in place of the carrycot and requires no additional adapters as they are already integrated. Doing so results in a practical Shop'n Drive System making days out with baby much more convenient. Safety is ensured thanks to the patented side-impact protection system and the secure 3-point harness. Once your little one is a bit bigger, or simply when you wish to change to a pushchair, you can use the comfy sports seat that features a reclinable backrest (all the way down to a lying position) and a multi adjustable footrest. The seat also comes with a 5-point harness and front bumper bar to help keep your child safe. A parking brake is also included which offers a strong hold for your stops. Package Includes: Hauck Malibu Pushchair Hauck Infant Carrier 0+ Car Seat Hauck Carrycot. Suitable from birth - 25kg. Particularly light and of compact folding. Comfortable seat with lying position. Adjustable back rest (different positions or continuously). Lockable and swivelling front wheels. Infant Carrier 0+ Car Seat. Suitable from birth - 9kg. Complete lie flat position for newborn. Easy to fit to chassis. Pushchair Open: 84 x 52 x 107 cm Folded: 93 x 52 x 35 cm Seat width: 33cm Weight: 8.1 kg Car Seat: 63 x 45 x 56 cm Car Seat Weight: 3kg Carrycot Inner Measurements: 75 x 30 x 20 cm Carrycot Weight: 4.2kg. Orders received by Online4baby are kept open / held for a maximum of 7 days. These should be made payable to Online4baby Ltd and sent to the following address: Online4baby Ltd, Unit B Broadgate, Broadway Business park, Chadderton, Oldham, OL9 0JA. This confirms that your item has been paid for in full, dispatched and is in the hands of our courier. At Online4baby we aim to deliver your order in the quickest possible timeframe from the point your order has been accepted. Please see the table and Courier tabs below for Courier information. 1 to 2 days (Mon-Sat). Parcels under 1kg in weight. Over 1kg but less than 1.2 metres in height. Excluding out of bound area charges. Also please allow 1 extra day (see individual Courier tabs for postcodes). England, Wales, Scotland (Excluding postcodes in the Scottish offshore Islands). These area's do not incur a surcharge but take 1 extra day to standard deliveries in the UK. Postcodes which are Out of Bound Areas. HS1-9, IV1-3, IV10-28, IV30-32, IV36, IV40-49, IV51-56, KA27-28, KW1-3, KW5-17, PA20-49, PA60-78, PH17-26, PH30-44, PH49-50, ZE1-3. This excludes bank holidays There are no collections or deliveries on bank holidays. However, due to circumstances beyond our (and their) control, such as extreme weather conditions, security checks, unforeseen incidents, miss-route of parcels, delays may occur. If you are working to a set deadline e. Holiday departure, a birthday please allow for extra time to cover any eventualities that may arise. It can only be collected from your chosen shop. All postcodes in England and Wales, and most of Scotland (excluding Scottish Highlands & Islands). Scottish Highlands and Islands - AB36-38, AB55-56, FK17-99. G83, HS1-9, IV1-28, IV33-56, IV63, KA27-28, KW1 -17, PA20-49, PA60-78, PH18-26, PH30-44, PH49-50, ZE1-3 Northern Ireland (BT1-99) Isle of Man (IM1-99) Scilly Isles (TR21-25) Republic of Ireland Guernsey (GY1-99) Jersey (JE1-99). AB31, AB33-35, AB44-54 PO30-42 (ISLE OF WIGHT). Orders cannot be depatched without this. All Items (excluding the below). Wood Items which include two boxes e. 2 or 3 Piece Nursery Room Sets(4 or 6 Boxes). Our courier will endeavour to deliver your order within the timescale stated in your order acknowledgment. Please note our courier DPD cannot leave goods without a signature. Collection charges are shown in the table below. It has taken over 25 years for Online4baby to develop into what we know it as today. Welcome to the Online4baby Ltd Terms & Conditions of Use. The term'you' refers to the user or viewer of our website. The item "NEW HAUCK MELANGE / GREY MALIBU 4 TRIO SET TRAVEL SYSTEM PUSHCHAIR CAR SEAT" is in sale since Saturday, March 30, 2019.